The historical evidence strongly supports the idea that open and democratic institutions breed innovation and creativity. Creativity is often highly concentrated in time and space, and across different domains. In the 15th century, Florence was home to an amazing number of ground-breaking innovators in literature, painting, sculpture, philosophy, and science. At the turn of the 19th century, Vienna hosted pioneers in painting, medicine, biology, psychology, philosophy, music, who all interacted with one another. London in the late 16th century, Paris in the early 19th century, and San Francisco and New York in the past few decades are some other examples of clusters of creativity and innovation in a number of seemingly unrelated domains (Banks 1997, Kandel 2012). What explains the formation and decay of such clusters of creativity? Are they driven by wealth, by specific features of local institutions, or by mere chance? More generally, aside from these exceptional clusters, how concentrated are creative activities in time and space? Is there co-agglomeration of creative people from different fields? And most important of all, what general lessons can be drawn from the historical analysis of creative clusters to foster innovation and the production of creative talent? Given the central role of creativity and innovation in human progress and economic development, knowing the answer to these questions is particularly important. Notable individuals in creative endeavours are a measure of upper tail talent and human capital. They are more likely to capture radical innovations and creativity compared to general indicators of human capital. Moreover, these data cover periods and domains where patent data are not available. They are thus suitable for studying the formation and decay of creative clusters, something that takes place over the very long run. Our main variable of interest is the number of famous people born in a city (per 1,000 inhabitants) in any given century. Births are a measure of the local production of creative talent. We also look at the number of famous immigrants (i.e. the number of deaths of famous creatives born elsewhere). Unfortunately, we don't have information on where these notable individuals did their most important work. Nevertheless, the data compensate for this inaccuracy with breadth in terms of time, geography, and disciplines. We start by exploring the temporal and spatial patterns in the data, documenting the following stylised facts. First, births of creative people and famous immigrants are spatially concentrated, generally more so than population. Figure 1 displays the spatial distribution of births in the 15th century, the middle of our sample. Darker tones indicate a larger number of births, while population size is captured by the circle diameter. Famous births are shown to be concentrated in a subset of cities, not always those with larger populations. Amongst the large cities, Florence, Nuremberg, and Siena have the most births of creatives, per 1,000 inhabitants. Notes: Darker tones indicate that more famous creatives were born in a city during the century, per 1000 inhabitants. A larger circle indicates a larger city population. Figure 2 displays the spatial distribution of Births in the 19th century, the end of our sample period. Now many more cities are included in the sample, and the darker tones have shifted to Northern Europe and the UK. The spatial distribution of Immigrants displays similar patterns. Second, births of creative people and famous immigrants are also clustered across disciplines, as in the prominent examples of Florence and Vienna cited above, and this is also true after conditioning on local observables. Hence, spillover effects associated with local proximity and/or local factors (observed or unobserved) are important for creative activities, and operate across disciplines and not just within each field. Third, births and immigration display persistence, though smaller than for population. Cities that are at the frontier of creativity in one period retain an advantage that persists for a while but not indefinitely. Estimating a transition matrix, we also find that persistence of creativity is higher at the bottom of the distribution than at the top. Most small and uncreative cities remain in that condition. But at the top of the distribution there is more reshuffling in creative clusters than for population – while most large cities keep growing and remain large, creative clusters exhibit more change over the centuries. Fourth, the overall spatial proximity of births and the distribution of birth-to-death distances did not change much over the centuries. This stability suggests that the agglomeration of creative activities is not very sensitive to the cost of transportation and communication, but reflects historically stable forces. We next address a number of questions about causality. A first natural question is whether creative clusters are influenced by local prosperity, or vice versa. With these non-experimental data we cannot provide a definitive answer. Nevertheless, we can exploit the temporal pattern in the data, using population as an indicator of local prosperity in a distributed lag model. We fail to reject the null hypothesis of no effect of lagged population on famous births and on famous immigrants. On the other hand, higher births and immigrants predict an increase in city size in the following century. This suggests that local prosperity does not play an important role in the formation or decay of creative clusters, in line with historical evidence on some prominent examples. On the contrary, becoming a hub of creative talent may contribute to subsequent economic growth. Population size is an imperfect measure of economic prosperity, and it is only measured at about the turn of the century. We therefore repeated the analysis with historical data on wages of skilled workers, expressed in grams of silver. Here the sample only includes about 30 major European cities, but time is measured in decades rather than centuries, and for most cities the period goes from 1400 to the mid-19th century. There is no evidence that wages started increasing before famous births or the arrival of famous immigrants, while the opposite is true – surges in local creativity are associated with subsequent wage increases. If not local prosperity, what explains the agglomeration of creative individuals in specific localities at different points in time? To answer this, we explore the effect of local political institutions and in particular the institutions typical of free cities. We measure city institutions by the dummy variable ‘Commune’, which classifies cities based on their political and administrative institutions at about the beginning of each century. As documented by historians, cities that became communes enjoyed more autonomy, protected personal and economic freedoms, and had forms of representative governance. We first study the production of creative talent, measured by births of creative individuals in each century (per 1,000 inhabitants). Here we do an event study analysis, where the treatment is becoming a commune. The main result of the event study is illustrated in Figure 3. Becoming a commune at the beginning of the century (date 0 in Figure 3) is associated with an almost 5 percentage point increase in the birth of creative individuals (per 1,000 inhabitants) during the current century, with an additional increase in subsequent centuries. Notes: The figure illustrates point estimates for leading and lagging indicators of the change in commune status. The omitted category is one period prior to the change in commune status. The dependent variable is Log (1+Births), where Births is the number of famous creatives born in a city, per 1000 inhabitants. Vertical bars correspond to 95 percent confidence intervals with region-clustered standard errors. The estimated coefficient corresponding to event time indicator +2 should be interpreted as referring to two or more periods after the transition into Commune. To address the possibility of endogenous transitions into commune status, we rely on instrumental variable (IV) estimation, exploiting the fact that the diffusion of communal institutions occurred in regional waves. These IV estimates confirm the results of the event study and are very robust. Next, we study whether the emergence (or disappearance) of communes is correlated with the flow of famous immigrants. Using bilateral data on city of birth and of death by century, we estimate a gravity model of migration. The main finding here is that economic and political freedoms make a city an attractive destination – becoming a commune is associated with an increase in the inflow of notable individuals, which almost doubles in size. Why is it that becoming a commune fosters local creativity? A priori, several answers are possible. First, the protection of personal and economic freedoms changed the local culture, making it more receptive to innovations and new ideas. Second, the new institutions also changed incentives, through a more meritocratic and inclusive social environment, but also by encouraging works of art and innovations that would enhance the prestige of the city. Third, free cities attracted talented and creative individuals who escaped censorship and persecution elsewhere, and this created role models and facilitated social learning, breeding new generations of innovators. These channels are not mutually exclusive, and it is likely that they are all relevant, although in our research we cannot discriminate amongst them. But, whatever the mechanism, the historical evidence strongly supports the idea that open and democratic institutions breed innovation and creativity. 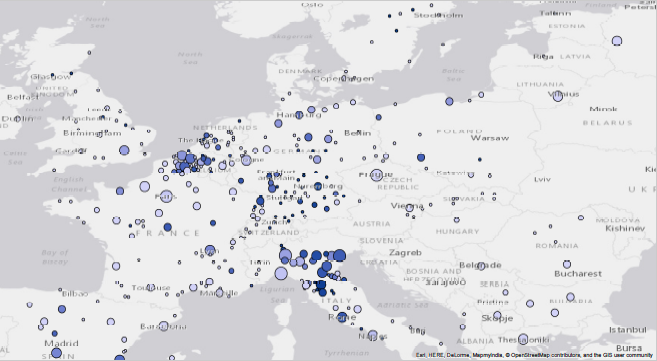 Bairoch, P, J Batou and P Chèvre (1988), “La population des villes europeennes: banque de donnees et analyse sommaire des resultats, 800-1850”, Publications du Centre d’Histoire Economique Internationale de l’Universite de Geneve (2). Banks, D (1997), “Clusters of talent”, Newsletter of the Classification Society of North America 48, February. Bosker, M, E Buringh and J L van Zanden (2013), “From Baghdad to London: Unraveling urban development in Europe, the Middle East, and North Africa, 800–1800”, Review of Economics and Statistics 95(4): 1418–1437. Gergaud, O, M Laouénan, E Wasmer, et al. (2016), “A brief history of human time: Exploring a database of ’notable people’”, Technical report, Sciences Po Departement of Economics. Kandel, E (2012), The Age of Insight: The Quest to Understand the Unconscious in Art, Mind, and Brain, from Vienna 1900 to the present, Random House. Schich, M, C Song, Y-Y Ahn, A Mirsky, M Martino, A-L Barabási and D Helbing (2014), “A network framework of cultural history”, Science 345(6196): 558–562. Serafinelli, M and G Tabellini (2017), “Creativity over time and space”, CEPR, Discussion Papers No 12365. A similar historical perspective is taken by a set of studies using microdata on upper tail human capital. In particular Gergaud et al. 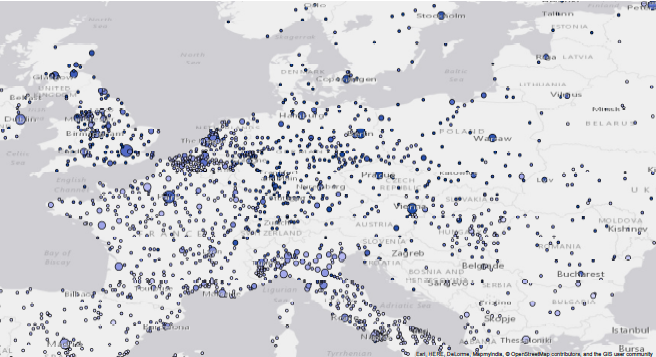 (2016) analyse a database of more than one million famous individuals and more than seven million places associated with them throughout human history (3000BCE to 2015AD). Relative to this work, we focus more specifically on creative individuals, on spatial patterns (using the city as the unit of analysis), on the flow of ideas, and on the effects of local self-government institutions on the formation of creative clusters.